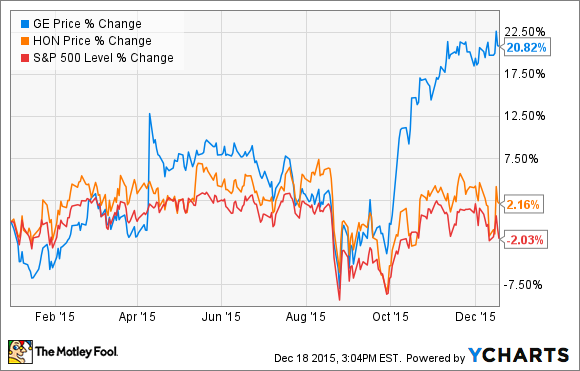 General Electric Company vs. Honeywell International: Which Is the Better Buy Going Into 2016? Both GE and Honeywell gave presentations on December 16th with their outlook for 2016. How do they stack up against each other? Organic revenue growth of 2% to 4%. Approximately $26 billion to be returned to investors, with approximately $8 billion in dividends and $18 billion in share buybacks. Free Cash Flow + Dispositions of $28 billion to $31 billion, up from an estimated $14 billion in 2015. Operating EPS of $1.45 to $1.55 per share, up 21% to 37%. The first thing you probably noticed is that free cash flow growth seems astoundingly high. That's because it includes an estimated $18 billion in dividends from GE Capital. Without those dividends, the number actually shrinks by between $1 billion and $3 billion. Those $18 billion in dividends are slated to be used for share buybacks. None of this is new news, however, so those buybacks are probably already factored in to the stock price. There are also a lot of question marks in GE's 2016 plans. The company plans to apply for de-designation as a Systemically Important Financial Institution, which would free up GE Capital dividends to be used for share buybacks. But there's no guarantee from the government that it will actually happen. After the collapse of its $3.3 billion deal to sell its finance unit to Electrolux, GE is expressing confidence that another buyer will be found. But again, there's no guarantee. As part of the aforementioned move to become a "digital industrial" company, GE launched GE Digital in September, which will sell data analytics software and services for its heavy-duty industrial equipment. The company forecasts at least a 10% increase in sales from 2015's $5 billion. But again, this is a new market for GE, so it's possible their projections are off. Sales are to increase 4%-6% over 2015, with core organic growth up 1%-2%. Segment margins and operating income margins are to increase between 10 and 50 basis points, or 80-110 basis points excluding mergers and acquisitions. Free cash flow is to increase $300 million-$600 million, or between 8% and 13%. Earnings guidance of $6.45-$6.70 per share, up 6%-10%. The most noteworthy of these projections is the earnings guidance. Honeywell boasts six consecutive years of double-digit earnings growth. With 10% at the top of its guidance range, though, the company is clearly anticipating slower growth ahead. One major challenge Honeywell faces in the coming year is also faced by GE: A weak oil and gas sector. Honeywell predicts that its Performance Materials and Technologies business will be affected by the continued weakness in global oil prices. However, the company still foresees a modest 1% to 4% gain in the sector. Most of this would be through M&A since core organic growth is expected to be essentially flat. Although only 11% of Honeywell's business comes from the oil and gas sector, the company expects that potential customers will delay investment as a result of low energy prices. To make this forecast, though, Honeywell is assuming an average price per barrel in 2016 of $45 to $55. Today, the price is just over $36 a barrel. It hasn't been at $55 since July. So, Honeywell is clearly counting on a dramatic rise in the price of oil by summer 2016. If that rise fails to materialize, investors should expect growth and sales to suffer. Both companies were very clear about the big picture: They expect growth to slow in 2016, but nevertheless anticipate rising sales and profits. GE is looking forward to a lot of changes it hopes will work in its favor. Honeywell expects pretty much business as usual. Headwinds in the oil and gas sector are projected to hurt both companies, but GE is more at risk, here, because of the size of its energy business. If oil prices don't rebound as quickly or as much as forecast, GE is likely to suffer more than Honeywell. Fundamentally, Honeywell is in a better position than GE, simply because there's less that can go wrong for it. Honeywell has a lengthy track record of growing its core businesses and delivering on its promises. GE, on the other hand, is in uncharted waters as it tries to reinvent itself, divest GE Capital and its Appliances business, shift into software and services, and de-designate as a SIFI -- all at the same time. If even one piece of this puzzle doesn't fall into place, the market may sour on the stock. Honeywell is clearly the safer play, here. Risk-tolerant investors, though, may want to jump into GE, but they had best be prepared for a bumpy ride.